Superb talk by Tariq Huq for Elementary students. Tariq talked about why he chose to Hifz of the Holy Quran and why he decided to pursue a BA in Economics at Loyola and in the Sharia at the Islamic University in Medinah. He key point was that children should consider pursuing careers that combine the deen and the dunya. He narrated how scholars of the past were both well versed in Sharia as well was the sciences. 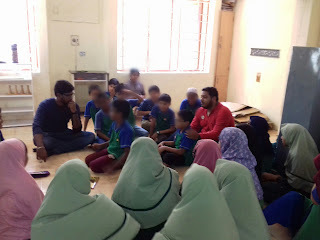 Cases like Ibn Rushd, Ibn Taymiyyah helped the children understand his point. He spoke about the importance of dua for success in the hifz process, the support of his parents in taking this unconventional route and the need for living life as per the Quran. Tariq talked about life at the University which fascinated the children. They loved seeing pictures of student displays at International cultural fests and trying to guess the country. JazakAllah Khair Tariq for taking the time out to come speak to the children.